Everyone knows what happens if you pout or cry around Christmastime: Santa Claus passes you by, that’s what. 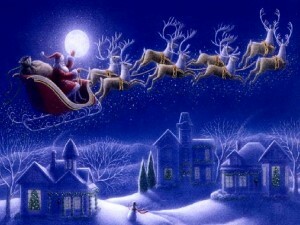 “Santa Claus Is Coming to Town” was written by J. Fred Coots and Haven Gillespie in 1934. Coots had been writing material for Eddie Cantor, a comedian with a radio show. Coots shared this song with Cantor, who nearly turned it down. Cantor’s wife, Ida, convinced him to air the song, and it was an instant smash hit with orders for 100,000 copies of sheet music the next day, and more than 400,000 copies sold by Christmas. The song is a traditional standard at Christmas time, and has been covered by numerous recording artists. In 1970 Rankin-Bass produced an hour-long animated television special based on the song, with narrator Fred Astaire telling the original story of Santa Claus.